The rich variety of tropical freshwater and marine fishes makes keeping an aquarium an absorbing pastime. Whether you are a novice or a dedicated fishkeeper, this fabulous fully illustrated comprehensive guide contains all the information and advice you need to ensure you get the most out of your hobby. 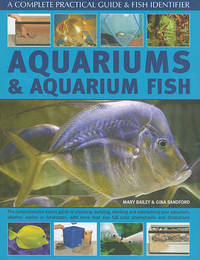 Written in a no-nonsense, practical style and illustrated throughout with over 650 photographs and diagrams, this is the book that every aquarium owner, whether beginner or expert, must own. Gina Sandford writes regularly for Aquarist and Pondkeeper, Fishkeeping Answers and Practical Fishkeeping magazines. She has been Secretary and Editor to the Catfish Association of Great Britain and lectures widely on tropical fishes. Mary Bailey has kept fishes for many years and has served on the committee of the British Cichlid Association since 1982. She regularly contributes to fishkeeping magazines and books, and was voted "Practical Fishkeeping Favourite Fishkeeping Writer, 1994".